A beautiful bird of the prairies. Horned Larks rival meadowlarks as the most colorful birds of North American grasslands. They live in prairies, fields, and tundra, but agriculture and development now intrude on many of the Horned Lark's traditional nesting areas. The farmland Conservation Reserve Program encourages agricultural landowners to plant resource-conserving vegetation. This practice protects topsoil and provides habitat for birds like the Horned Lark, as well as other wildlife. Today’s show brought to you by the Lufkin Family Foundation. A high-pitched, tinkling bird song floats across an open landscape of short grasses. But, strangely, there’s no singer in sight. Our bird, a male Horned Lark, is a hundred feet in the air — hovering, wings fluttering, circling against the blue sky. Now, the bird is gliding steeply, headlong towards the ground, flaring its wings at the last instant to break the dive. Horned Larks – roughly the size of sparrows – rival meadowlarks as the most colorful birds of North American grasslands. The male’s bright yellow face is framed by crisp black sideburns. And true to its name, the Horned Lark does have horns, of a sort. When in the mood, the male erects pointed black feathers above its eyes, giving it a devilish demeanor. Horned Larks live in prairies, fields, and tundra. Agriculture and development now intrude on many of the Horned Lark’s traditional nesting areas. However, programs that replenish grasslands and set aside croplands can be a boon to this exquisite bird. 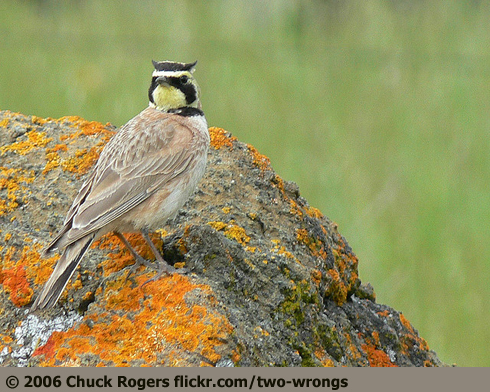 Learn more and see a picture of a Horned Lark at our website, BirdNote.org. Today’s show brought to you by the Lufkin Family Foundation. Bird sounds provided by The Macaulay Library at the Cornell Lab of Ornithology, Ithaca, New York. Recorded by G.A. Keller. Producer: John Kessler; Managing Producer: Jason Saul; Editor: Ashley Ahearn; Associate Producer: Ellen Blackstone; Assistant Producer: Mark Bramhill.